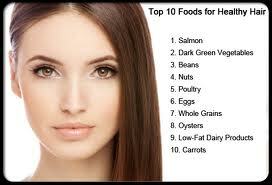 Columbia Md Hair Salon Vivid Salon / The Healthy Hair Diet | Best Salon and Spa in Columbia MD! We can use all of our magic powers to make your hair look fabulous when you leave the shop. If you’re not taking care of your hair from the inside out, all of our work is short lived. Why? Because what you eat can either work its own magic or wreak havoc. Your hair is more than 90% protein, so make sure you get plenty of it. Hair loves vitamin A, too, so get plenty of fruits and vegetables like cantaloupe, apricots, squash, sweet potatoes and carrots. And like mom said, eat your broccoli! B vitamins help promote hair growth and prevent hair loss and breakage. So include beans, sunflower seeds, peas, nuts and leafy green vegetables. Fast food is a fast hair wrecker, so cut those down, then cut them out! Keep those locks shiny and bouncy!